Innovative radio remote control system for tracking rigs weighting over 65 tonnes. The radio remote control system is a hand held unit with the ability to start up the engine, track the rig and also stop the engine. This innovative solution is particularly suitable during loading and off loading operations. The system removes the need for operators to access the cabin whilst the machine is on a low-loader, therefore eliminating the working at height issue. In addition, it enables the operator movement around the rig during the process to give the best visibility of the task in hand. The radio remote control system was first installed on two new Soilmec SF-65 Rigs for Bachy Soletanche Ltd, supplied in July and August 2014. The working at height risk with previously required access and egress to the cabin has been completely eliminated, giving a safe system of work to the operator. The feedback from Bachy Soletanche has been very positive. Bachy Soletanche recognised that accessing our larger rigs whilst on low loaders has associated risk. 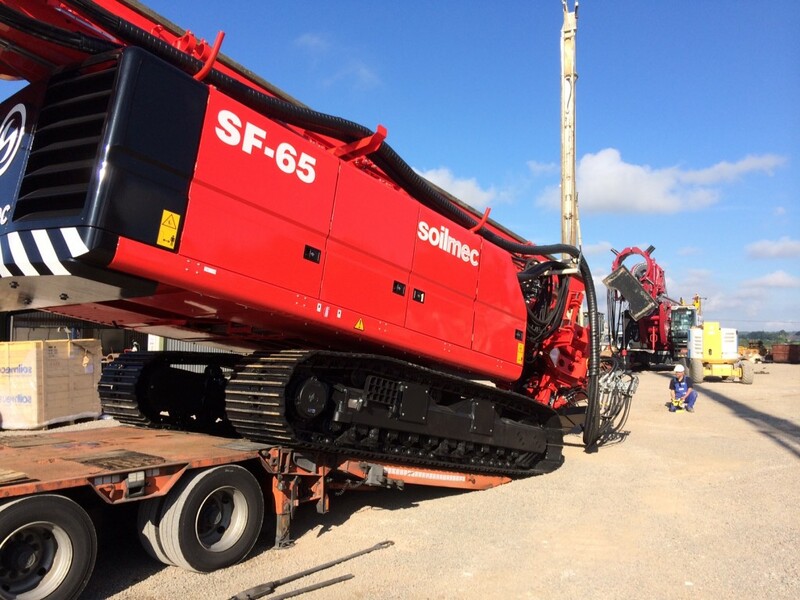 Working with Soilmec we requested a remote starting stopping and traveling facility on our latest SF65 rigs. This has proved to be a huge step forwards in reducing risk to our operatives whilst accessing our rigs for loading and unloading. The system has proved to be very effective and will be a standard requirement on any new rigs we purchase. – Andrew Egglesden, Bachy Soletanche. The remote control system is now available as an option on all new Soilmec piling rigs. We send out a regular email newsletter with useful drilling industry information, news articles and upcoming events as well as news of new and used machinery. Hundreds have signed up already - you can unsubscribe at any time if you wish. Soilmec 5000th LDP machine with VolkerGround Engineering.